Then Solomon began to build the Temple of the Lord in Jerusalem on Mount Moriah. It was on the threshing-floor of Araunah the Jebusite, the place provided by David, his father. 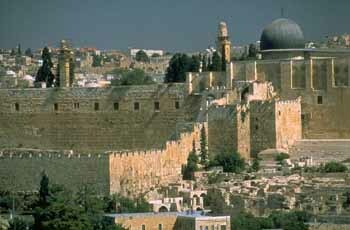 The Temple Mount is the trapezoid-shaped, walled-in area in the southeastern corner of the Old City of Jerusalem. The four walls surrounding it date back – at least in their lower parts – to the time of the Second Jewish Temple, built at the end of first century B.C.E. These huge supporting walls, partly buried underground, were built around the summit of the eastern hill identified as Mount Moriah , the site traditionally viewed as the location of where Abraham offered his son Isaac as a sacrifice and the known location of the two Jewish Temples. The gaps between the walls and the mount were filled in to create a large surface area around the Temple. Its eastern wall and the eastern half of its southern wall form part of the city wall on those sides. Deep valleys (now partly filled by debris) run outside the walls (northeast, east, south, west), thus separating the Temple Mount from and elevating it above its surroundings, both inside and outside the city. The dimensions of the Temple Mount extend considerably beyond those given in the Mishnah (Mid. 2:1), which describes a square of approximately 250 × 250 m., referring only to the sanctified area within the Temple Mount as known today. The entire enclosure consists of an esplanade or courtyard, surrounding an elevated platform occupying approximately 36 acres of land and decorated by arched structures around the Dome of the Rock. In each of the walls there are a number of gates. Some are ancient gates such as the Golden Gate which are blocked, and some are newer gates from the Arab conquest onward which are still in service. Within the area of the Temple Mount there are about 100 different structures from various periods, among them great works of art and craftsmanship, including open Muslim prayer spots, arches, arched porticos, Muslim religious schools, minarets, and fountains (some for drinking and others for worshipers to wash their hands and feet before prayer). Underneath the present-day surface, in the artificial parts of the mount, there are 34 cisterns. There are also other substructures, the largest of which is known as Solomon's stables. The Temple Mount (Heb., Har Habayit; Arabic, Haram esh-Sharif, the Noble Sanctuary), is identified in both Jewish and Islamic tradition as the area of Mount Moriah where Abraham offered up his son in sacrifice (Genesis 22:1-18; the Koran, Sura Al-Saffat 37:102-110). Here King Solomon built the First Temple almost 3,000 years ago. It was destroyed by the Babylonians in 586 BCE, but 70 years later Jews returning from exile built the Second Temple on the same site. King Herod refashioned it into an edifice of great splendor. In Muslim tradition, the place is also identified as the furthermost sanctuary (Arabic, masjid al-aksa) from which the Prophet Mohammed, accompanied by the Angel Gabriel, made the Night Journey to the Throne of God (The Koran, Sura Al-Isra’ 17:1). Following the destruction of Jerusalem by the Romans in the year 70, the area of the Temple was deliberately left in ruins (first by the Romans, then by the Byzantines). This desecration was not redressed until the Muslim conquest of the city by the Caliph Omar ibn al-Khattab in 638. He ordered the clearing of the site and the building of a house of prayer. Some 50 years later, the Umayyad Caliph Abd al-Malik built the Dome of the Rock to enshrine the outcrop of bedrock believed to be the place of the sacrifice on Mount Moriah. He (or his son, the Caliph al-Walid I) also built in 1033 the large mosque at the southern end of the Haram, which came to be called al-Aqsa after the Koranic name attributed to the entire area. After the conquest of Jerusalem by the crusaders, the Dome of the Rock was converted into a church and called Templum Domini (the Temple of the Lord) and al-Aqsa became a church called Templum Solomonis (Solomon's Temple). They were reconverted into Muslim houses of worship after Saladin's conquest of Jerusalem in 1187 and have remained so ever since. During the 1948 Israeli War of Independence, Jordan retained control over Jerusalem's Old City and the Temple Mount and subsequently refused entry to the area to any Jewish person. During the 1967 Six-Day War, the Israeli Defense Forces captured Jerusalem and liberated the Temple Mount, reclaiming Jewish control over the area for the first time since the destruction of the Second Temple. Though Israel could have taken control of them, the Islamic holy places were put in the care of a Muslim Council and Jews were barred from praying on the Mount in the hope of minimizing bloodshed and preventing a holy war. For Jews, visiting the Temple Mount is a very controversial subject- both in terms of religious allowance and because non-Muslim prayer is prohibited at the site. Although freedom of access to the site is enshrined as law, Israel does not allow non-Muslim prayer on the Mount so as not to offend Muslim worshippers. Beyond this, many rabbi's say that since the Jewish Temple's Holy of Holies stood near the center of today's Temple Mount, Jews are religiously forbidden from entering the area. Because of the sensitivity of the Temple Mount, Israelis enforce strict security measures for Jews and Muslims alike. For instance, during Friday prayers, any Muslim under the age of 45 is prohibited from ascending the mount; a rule put in place in response to young demonstrators throwing stones at Jewish worshipers at the Western Wall. Additionally, no Jewish groups can pray in the plazas surrounding the mosques or provoke the Muslims. The Temple Mount sifting project began in 2004, with the goal of unearthing the hidden history of one of the holiest places in the world. Since it's inception over 170,000 tourists and locals have participated in the project, sifting through mounds of rubble and dirt in attempts to find ancient coins and other items. Archaeologist Dr. Gabriel Barkay oversees the excavation, and claims that approximately 50% of the earth removed from the Temple Mount site has revealed insights into the history of Jerusalem. Discoveries have included coins, pottery shards, building fragments, arrowheads, and ancient seals. In 2005, the bridge leading to the Mugrabi Gate collapsed after a landslide occured on the site following heavy winter storms and two years later, Israel decided to build a temporary, detour bridge to ensure non-Muslim access to the Mount. Israel had also considered renovating the centuries-old bridge, but their decision was widely assailed by Palestinians as an attempt to destroy their historical site. Though this claim was patently false, Israel decided to not go ahead with construction so as not to inflame an already volatile region. In 2011, the Western Wall Foundation forced the government to close the four-year old temporary bridge leading to the Mugrabi Gate for fear that its instability could lead to its collapsing. Three police officers were injured after the Temple Mount opened to non-Muslim visitors on October 8, 2014, in clashes between masked Palestinian individuals and the police officers. The masked individuals began throwing rocks, pieces of metal, large cinderblocks and molotov cocktails, and spraying flamable materials at the officers soon after the Mugrabi entrance to the Temple Mount opened. The Mugrabi entrance is the only entrance to the Temple Mount specifically for non-Muslim visitors, located near the Western Wall. As the calendar counted down to Sukkot, more and more Jewish individuals came to visit the holy site, causing increased tensions. According to Israeli police, in advance of the disturbance the masked Palestinians had placed objects to block the police access to areas of the Temple Mount, and poured flamable liquid on objects in the vicinity that they later attempted to set ablaze with their molotov cocktails. After the initial clash, the rioters were chased into the al-Aqsa Mosque where they baracaded the doors with large marble slabs, furniture, and wood posts. Bricks, rocks and fireworks were thrown at the officers from inside of the mosque, causing great permanent damage to the interior, and the rioters also sprayed an unidentified flamable substance on the officers which made breathing difficult. Three officers were hit and injured with rocks and fireworks. A fire broke out inside of the mosque, started by a stun grenade thrown in by an Israeli security officer. Five arrests were made and dozens of Palestinians were injured during these clashes. Calm was restored to the Temple Mount later in the day and the site was opened again to the public after remaining closed for a short period of time. On October 17, 2014, Palestinian Authority President Mahmoud Abbas gave a speech in which he stated that we have to prevent the settlers from entering the Temple Mount by any means. It is our mosque and they have no right to enter and desecrate it. Tensions rose to critical levels following violence at the Temple Mount and al-Aqsa Mosque in late 2014. Following tense weeks of riots in Jerusalem surrounding access to the Temple Mount and the al-Aqsa Mosque, on November 1, 2014, Israeli Prime Minister Benjamin Netanyahu met in secret with Jordanian King Abdullah II in Jordan's capital city of Amman. During the meeting Netanyahu and King Abdullah discussed security at the Temple Mount and the al-Aqsa Mosque: members of the Jordanian Waqf Authority are stationed at the al-Aqsa Mosque and help provide security. The purpose of this meeting was to coordinate security measures at the holy site between the Jordainain Waqf Authority and the IDF. A few days after the meeting, Netanyahu called King Abdullah and assured him that the Jordanian special status at the Temple Mount would not change. Palestinian individuals participated in various acts of violence and incitement at the Temple Mount and al-Aqsa Mosque during October and November 2014. Protestors with bags over their hands and feet and masks on their faces to obstruct their appearance flung rocks, molotov cocktails, cinderblocks, and other items at Israeli security forces on multiple occasions. On November 13, 2014, more than 60 foreign Ambassadors and Diplomats stationed in Israel were briefed by the Israeli Police Commissioner and Deputy Foreign Minister about the status of the recent situation at the Temple Mount. During the briefing they were shown photos and videos of Palestinian individuals building barriers and other obstructions with trash cans and other materials to prevent security personnel from accessing certain areas of the grounds, and hurling fireworks and molotov cocktails from within the al-Aqsa Mosque where there is abundant historical and irreplacable material. The only harm that came to the al-Aqsa Mosque came from the Palestinians themselves. In early 2015, Palestinian women began to “protect” the al-Aqsa Mosque from Jews, with one woman stating that “everybody must protect Al Aqsa so the Jews don’t take it. They have their eyes on it.” The dean of Islamic studies at Al-Quds University, Mustafa Abu Sway, stated that “there is no similar situation” in Islamic history where women had taken such an active role in the gaurding of a holy site. The women chanted at Jewish visitors, hurled anti-Semitic slurs, and chased Jewish individuals, leading some of them to be banned from the holy complex (New York Times, April 17, 2015). A large group of masked Palestinian protestors attacked Israeli security forces at the Temple Mount with rocks, molotov cocktails, homemade explosives, firecrackers, and peices of wood during the weekend of July 25, 2015. The protestors brought these dangerous items with them to the al-Aqsa Mosque, with the intention of using them to attack Israelis who had gathered at the Western Wall for the mourning and fasting holiday of Tisha B'Av. After initially clashing with Israeli security forces, the protestors retreated inside of the al-Aqsa Mosque and began throwing items at police officers from within the Mosque. In response, the police officers ventured inside of the Mosque and closed the doors and windows, which diffused the situation. Hundreds of Jewish individuals visited the Western Wall during the holiday. Members of the Israel Allies Foundation's Congressional caucus were harassed by a group of Arab men while they visited the Temple Mount on August 11, 2015. The group of U.S. Congressmen were visiting the Temple Mount as a part of their planned trip to the Middle East, and were, “immediately approached by several men who started shouting,” upon their arrival to the holy site, according to Representative Keith Rothfus, Congressman from Pennsylvania. Rothfus continued, describing that the group of Congressmen were, “tracked the entire time we were there and we found these individuals surprisingly intollerant and belligerent.” Arab men at the Temple Mount shouted at the Congressmen's wives that they should cover themselves, even though they were wearing long sleve shirts and ankle-length skirts. Allegedly Jordanian Waqf gaurds, who carry the responsibility of providing security at the Temple Mount, began harassing the guide who was leading the Congressmen and trying to take his maps away. Police were called to break up the commotion as a group of 15-20 individuals began shouting at the Congressmen, and for the rest of their visit the group was followed by several Arab men who continued to intimidate and antagonize them (Jerusalem Post, August 11, 2015). Palestinian leaders spread false rumors in late 2015 that Israeli authorities were considering altering the status-quo at the Temple Mount and allowing Jews to pray in the mosques, which stoked the flames of violence. Palestinian Muslim protestors and Israeli police clashed on the Temple Mount during the weekend of September 12, 2015. Palestinian youths and young adults holed up inside the al-Aqsa Mosque and flung molotov cocktails and large rocks at the security forces attempting to keep the peace among chaos. Twenty-six Palestinians were injured during the confrontation along with five Israeli policemen. The violence damaged the windows and the carpets inside the mosque. In response to this violence, Israeli officials ramped up security and deployed additional soldiers and police officers in the area surrounding the Temple Mount. The following weekend Palestinian protestors once again clashed with Israeli security officers at the Temple Mount, but the situation was much more controlled. Following a series of terror attacks targetting Israelis during September and October 2015, Israeli authorities implemented age restrictions on the Temple Mount for the second time in less than one year, and closed Palestinian access to Jerusalem's Old City. On October 4, 2015, Israeli security officials announced that they were banning non-resident Palestinians from the Old City of Jerusalem, as well as banning Muslims under the age of 50 from the al-Aqsa mosque compound. The security forces had most recently restricted access to the mosque only to patrons over 50 years of age in November 2014. Although these restrictions were lifted two days later, the violence escalated. During the subsequent week seven Israelis were killed and twenty were injured by Palestinian terrorists, mostly in stabbing attacks. These “lone wolf” attacks are unpredictable and impossible to prevent, often spontaneous and deadly. The Israeli military deployed reserve troops throughout Jerusalem during the second weekend of October to assist security forces in countering this wave of violent attacks. Six companies worth of troops were deployed in Jerusalem on October 13, and security gaurds were on high alert country-wide. The violence continued into the next week. On October 20, 2015, the Palestinians, backed by six Arab states, succeeded in erasing the historical connection between Jews and their holy sites by convincing the United Nations Educational, Scientific, and Cultural Organization (UNESCO) to list the Cave of the Patriarchs in Hebron and Rachel’s Tomb in Bethlehem as Muslim sites. The resolution, which passed 26-6 with 25 abstentions, also condemned Israel for archaeological excavations in the Old City of Jerusalem and particularly near the Temple Mount. The Arabs also wanted to designate the Western Wall as an extension of, and part of the al-Aqsa Mosque, but they were forced to back down after a storm of international protest and the opposition of UNESCO’s Director-General. The final draft also softened some of the anti-Israel rhetoric and omitted a reference to Jerusalem as the “occupied capital of Palestine.” To read the Israel Ministry of Foreign Affairs rejection of the decision un UNESCO, please click here. The executive board of UNESCO adopted a resolution on April 15, 2016, which ignores the historic Jewish connection to the Temple Mount. The resolution refers to the entire Temple Mount area only as the al-Aqsa Mosque, only referring to the Temple Mount in parenthesis. The UNESCO executive board solely blamed Israel for the violence that occured at the Temple Mount in Fall 2015, completely omitting any mention of the aggression and instigation by Muslim rioters. The resolution addressed the period of violence that began in October 2015, citing “constant aggressions by the Israeli settlers,” as the primary catalyst and failing to mention the Palestinians who continue to attack Israelis or the 34 Israelis who were killed in these attacks. Prime Minister Benjamin Netanyahu released a statement in response to the resolution, accusing UNESCO of “rewriting a basic part of human history” (Jerusalem Post, April 15, 2016). Israeli security officials made the decision to lengthen the time in the mornings dedicated to Jewish and non-Muslim visitations to the al-Aqsa compound by one hour. This decision, announced on December 5, 2016, allows Jews and non-Muslims to visit the al-Aqsa compound from 7:30 a.m. to 11 a.m., instead of 10 a.m.
On July 13, 2017, three Arab-Israeli gunmen approached the ancient stone gates near the Temple Mount and murdered two Arab-Israeli police officers from Israel’s Druze community (Ha’il Satawi and Kamil Shnaan). A third police officer was lightly wounded. The shooters were subsequently killed by Israeli security forces. Israeli authorities shut down the holy site for two days for searches and subsequently learned an accomplice had hid the weapons used in the attack in the al-Aqsa mosque. This was only the third time the Temple Mount had been closed since the 1967 War. It was reopened on July 15, 2017, with newly installed metal detectors, which Israelis officials said were necessary to ensure the safety of visitors to the site. Cameras were added a few days later. The security measures are similar to those used at other holy sites around the world; nevertheless, Palestinians and some other Muslims outside Israel claimed they altered the status quo of the holy site. Fatah subsequently incited violent protests and Palestinian Authority President Mahmoud Abbas announced he was cancelling all cooperative activities with Israel until the detectors were removed. Meanwhile, the Waqf called for worshippers to avoid the Temple Mount if the security measures remained in place. On July 24, 2017, Israel decided to remove the cameras and metal detectors to defuse the situation while considering the introduction of other security measures. The Dome of the Rock (Arabic, Qubbat al-Sakhra) is one of the most recognizable architectural glories of the world. The design of the building is basically Byzantine - double octagonal ambulatories encircling the Holy Rock. A shrine and not a mosque, it is the third holiest place in Islam after the Ka’aba in Mecca and the Prophet’s Mosque in Medina. 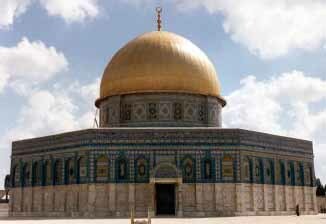 The Dome of the Rock is an architectural expression of the ascendancy of Islam. The interior glass mosaics in the drum and dome contain representations of Byzantine imperial jewelry, and one of the ornate inscriptions affirms that God is One and not three; and that Jesus was an apostle of God and His Word, and not His son. The shrine stands on or near the approximate site of the Jewish Temple (though scholars disagree whether it was the Holy of Holies or the Altar that stood on the site of the rock). It has even been suggested that the Temple building stood 80 meters further north, on the site of the small 16th-century Qubbat al-Arwah (Arabic, Dome of the Winds or Spirits) on an east-west axis with the present Golden Gate. The exterior of the Dome of the Rock has undergone several restorations. The exterior tiles were last restored in 1963; the gold-leafed dome in 1994). The al-Aqsa Mosque, at the south end of the Temple Mount platform, was last rebuilt in 1035 and has since undergone several restorations - most recently in 1938-42; and again beginning in 1969 to repair extensive damage from a fire deliberately set by a deranged Christian tourist. The design of the building is that of a basilica with a narrow central nave flanked by six aisles (14 aisles in an earlier 8th-century phase). The decoration of the mihrab (prayer niche) in the south wall was a gift of the Sultan Salah al-Din (Saladin). The beautiful inlaid cedar wood minbar (pulpit), also donated to the mosque by Salah al-Din was destroyed in the 1969 fire. A stairway in front of the north entrance to the al-Aqsa Mosque leads down to a vaulted passageway and the walled-up Hulda Gates, which had been an entrance to the Temple Mount Platform at the time of the Herodian Second Temple. During the Mamluk and Ottoman periods and until the mid-19th century, non-Muslims were not permitted onto the Haram. The first known exception was made by order of the Ottoman Sultan in 1862, during the visit of the Prince of Wales, the future King Edward VII. Ian Deitch. Islamic leaders boycott Jerusalem site over metal detectors, Yahoo News, (July 17, 2017).